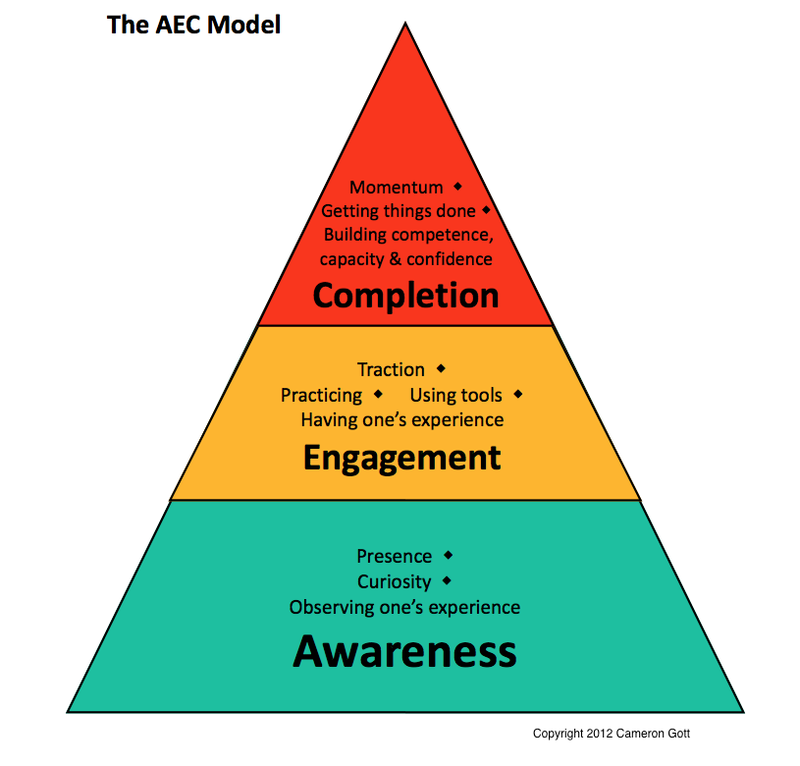 The AEC Coaching Model is what I use with all of my clients to help them develop the skills for effective follow-thru. Developed with Denslow Brown, MCC, the AEC Model is an integral part of our ADHD coach training program at Coach Approach for Organizers and the basis for my monthly coaching best-practices course, Fostering Mindful Change. The AEC Model is highly adaptable to change models and the partnership-rich context of coaching. Leadership and productivity coach Ellen Faye and I have found a version of the AEC highly effective in our Leadership Coaching courses. Change begins with awareness. ADHD disrupts the ability to create accurate awareness moving the individual away from the fact-based place of 'Cause' and shifts them to the stimulating and inaccurate place of 'Effect'. Good coaches help clients foster accurate awareness of goals, challenges, strengths through the coaching skills - modeling, cueing and educating. Talk is cheap. Our experiences are rich laboratories for learning. Experiences don't happen without engagement. ADHD plays havoc with the ability to engage and re-engage what is truly important to the client. ADHD coaches support their clients with realistic actions plans developed with the client and powerful and positive accountability based in respect and trust. Completions and completion opportunities are all around us - the key meeting with follow-up actions identified, the progress report delivered to the CEO on time, the delivered product. Larger relevant milestones are made up of smaller completions but much like a transition, the art of effective completion is hampered by ADHD and its related challenges around prioritizing, activating and sustaining effort (in the midst of multiple competing interests) to final task completion. Many Global Creatives will value speed and momentum over agility and maneuverability and blast through key intersections or pivot points in their work day burning up valuable time, attention and energy. Good coaches help clients identify key completion points and support their efforts to hit the mark, make adjustments and move forward. I start by encouraging my clients to use the three terms as they talk and think about their key intentions. I am aware that I am spinning my wheels! I am aware that I am more productive in the AM. I just got engaged 'in the weeds' working on this damn spreadsheet! I am engaging but not completing. I want to disengage from surfing the web but am not being successful! That completion was ugly but still a completion! My clients have found that using the actual terms is like adding new cogs to their gear box and allows for smoother shifting from standing still into their intended task (and back again). It also provides new language to replace old judgmental terms like ‘lazy’ and ‘sabotage’ that don’t accurately represent the true EF challenges in play.